In the beginning was the Word, and the Word was with God, and the Word was God . . .
Is it any wonder that the burden to teach adults to read was first felt and acted upon by the church? Over 80 years ago, Frank Laubach became a literacy pioneer while working as a missionary with the Moro people of the Philippines. After a slow start, he earned trust by learning their language and enough about their Muslim religion to discuss and exchange ideas. He then developed a dictionary and simple method of teaching them to read in their language. “Each One Teach One” incited an evangelistic harvest among the Moros, with conversions to Christianity the norm. 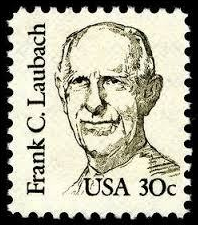 Laubach spread the campaign globally over the next two decades with continued success. On February 24 volunteers affiliated with the Forward Training Center in Granbury, TX, will gather to learn how to teach adults to read better. They’ll use the Laubach Way to Reading materials as a core curriculum. And they’ll be thinking about strategies to take the fear out of asking for help. Join us. Contact us for more information about teaching adults to read better. This entry was posted in Adult Literacy, Uncategorized. Bookmark the permalink.